This is the best priced 46 Grand Banks Europa currently on the market. Her owners have loved her and enjoyed traveling with her all over the East Coast during the past 16 years and are now thinking about making a change. Irish Lady had her spring launch and commissioning and is sitting pretty in the water ready for a great 2018 summer of fun. Easy to inspect…so call and come take a look at this pretty Europa. 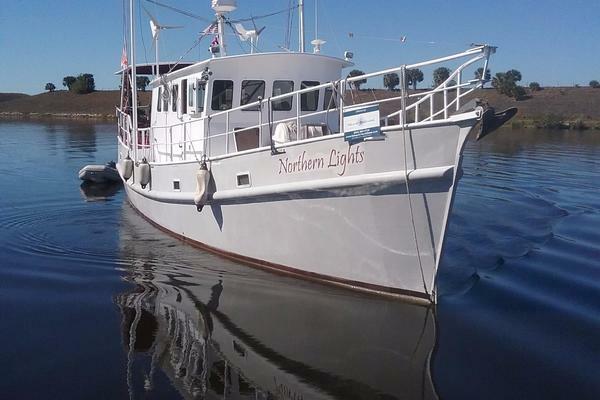 She is a nicely maintained example of the popular Grand Banks 46 Heritage Europa. With her in-line six cylinder Caterpillar engines, her engine room is a dream to work in. The only 46 Europa we have seen with Captains Quarters built into what we originally referred to as the garage space (the very large storage/utility area aft of the house and forward of the lazarette). She is on her second owner, originally from Florida she has been a New England boat since 2002 and is always stored under cover in the off season. Priced right for an immediate sale. West Florida Yachts would love to guide you through a personal showing of this 46' Grand Banks 46 Heritage Europa 1996. This yacht for sale is located in Falmouth, Massachusetts and priced at $284,000. For a showing please contact us by filling out the form on this page and we will get back to you shortly! Grand Banks is well known for their superbly crafted full varnished teak interiors and this yacht is no exception. She has the preferred solid teak parquet soles and is the preferred two stateroom, two head galley up layout. There is an abundance of natural light and ventilation courtesy of the salon/helm deck that is fully surrounded by large windows, several of which are sliders with screens. Forward there are smaller slider type windows in the trunk cabin in each stateroom and head as well as overhead hatches. Artificial light is also superb with brass swivel style reading lamps at each berth and settee as well as several overhead lights throughout. When natural ventialtion is not enough, cooling is provided via three reverse cylcle (they also can provide heat) air conditioning units. Starting forward is the Master Stateroom featuring an island queen berth below. There is storage in a full sized chart drawer and four cargo drawers. There is additional storage in lockers outboard, a five drawer bureau and cedar lined hanging locker with light. A 15" TV is in a cabinet aft and to starboard followed by the separate shower comparment while opposite to port is the private head featuring Vacuflush W.C. and a generous vanity with ample storage. Next aft and to port is the Guest Stateroom which features two thwartship running 6'-6" berths below. There is storage in drawers while hanging storage is outboard between the berths in a cedar lined hanging locker with light. Opposite to starboard is the Guest Head featuring a separate stall shower compartment, combination washer an dryer unit, large vanity with excellent storage and Vacuflush W.C.
Up four steps (storage under some of them) to the Salon, Galley and Lower Helm Station. The U-Shaped Galley is to port and features expansive Corian counter space and storage in several lockers and drawers, stainless steel single basis sink, Princess 3-burner stove with oven and Sharp convection microwave. Refrigerated storage is in two boxes with Grunert 12V refrigeration with small freezer compartments. The yacht was ordered with the optional overhead dish lockers. Opposite to port is the Lower Helm Station with double helm seat, full navigational and engine controls and the yachts electrical distribution panels. Adjacent to the helm is a side door for quick access to the starboard decks. Aft is the full width salon that opens out onto the aft deck via two wide double doors, to port is the dining settee, an L-shaped arrangement and teak drop leaf table on a high low pneumatic assist. Aft is a small bureau with storage. Opposite are two barrel chairs with storage under and an entertainment console with storage. Forward of the seating area is a dry bar housing bottle and glass storage and the U-Line ice maker. Unique to this Grand Banks 46 Europa is the short term "Captains Quarters" built into what is otherwise a generous utility compartment aft of the engine room, below the forward portion of the aft deck. Access is gained via the aft deck and there is a double berth to starboard, electric W.C. to port along with a small vanity and sink. Wired for both 12 volt and DEC and 120 volt AC power. An Onan 8KW generator showing 1550 hours handles heavier loads when off the dock while a Heart/Freedom 3000 watt inverter handles lighter loads. A pair of 3116 Caterpillars that have been well maintained turn 4-blade Nibral propellers on 2" stainless shafts through twin disc 2.5:1 reduction gears. 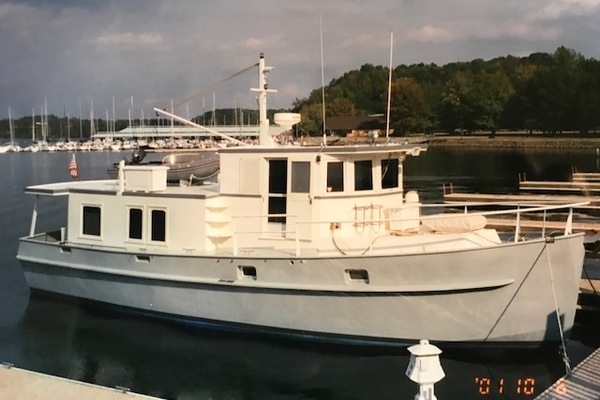 Solid fiberglass hull with original white gel coat in excellent condition with molded in plank lines, spray rails, rub rails and quarter rails. The rub rail is capped with bronze half round as is the varnished teak cap rail. Flag blue gel coat boot top in excellent condition and hard expoxy anti fouling with minimal build up. Full walk around decks and an expansive aft deck all with the traditional Grand Banks 9/16" thick (thickest in the industry) teak deck overlay in excellent condition. Varnished teak cap rails and safety rails and other trim. Again all varnish work is in very good to excellent condition. Bronze deck hardware including stanchions, cleats and chocks. There are gates P & S and at the transom to provide ease of access. Part of the beauty of the Europa layout is bringing the outdoors in with her wide double doors opeing from the salon on the aft deck. Irish Lady affords expansive living area on the main deck level. Access to the Captain's Quarters and a generous lazarette is via hatches in the aft deck. Up the varnished teak ladder to the flying bridge where there is an equally expansive area for family and guests with open deck to port and the optional L-settee which can seat up to 6 with table to starboard. Forward there are the standard fore and aft facing bench seats with storage under (storage is also found under the L settee) capable of seating 8. When one wishes to be out of the sun, a bimini with 3/4 enclosure covers the forward area. Irish Lady is on her second owner, originally from Florida she has been a New England boat since 2002 and is always stored under cover in the off season. She is attractively priced for immediate sale.